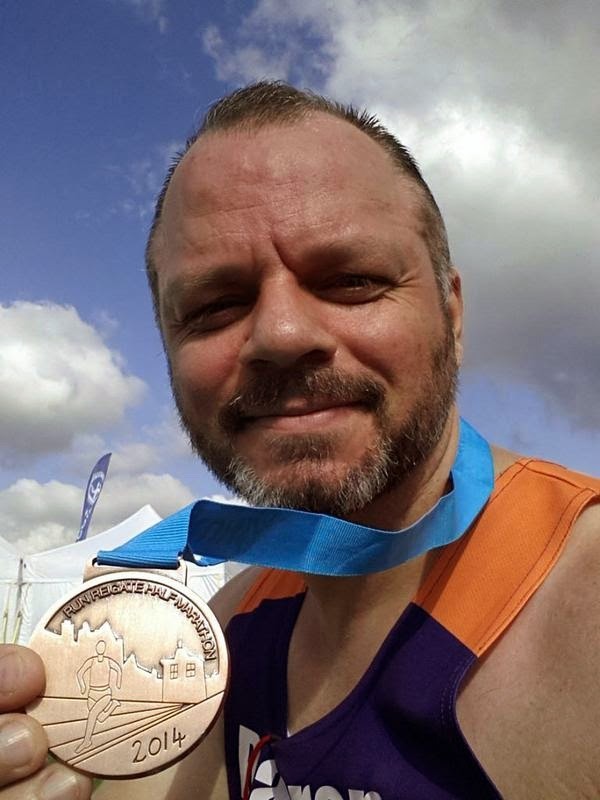 I have run a lot of inaugural races over the past couple of years, the Surrey Half I really liked, and the Hackney Half not so much. Running jet-lagged and frozen around a water-logged NASCAR arena for the first ever North Carolina half; had a great medal but will forever be my worst time for a half. I had never been to Reigate and was excited to spend a weekend in the countryside in an adorable town that was only 45 mins from London Bridge. I booked myself on this race as soon as I heard about it, receiving details of it in an email from the Surrey Half. Sponsored by Adidas, the race packs were not sent out. Instead you had the option of collecting them before the race (something that I always find unnecessarily stressful) or from a sports shop in town in the days leading up to it. I was staying overnight as the lovely Cranleigh Hotel on West Street, so the sports shop was fortunately on the way from the station there. A night at the Cranleigh Hotel and great dinner at the Market Stores the night before should have put me in good stead for the race but I had THE WORST NIGHT SLEEP EVER. Trust me, Stephen King could’ve penned the night I had. That should not take away from the lovely hotel run by Bruno and Michael. It was superb in every way. 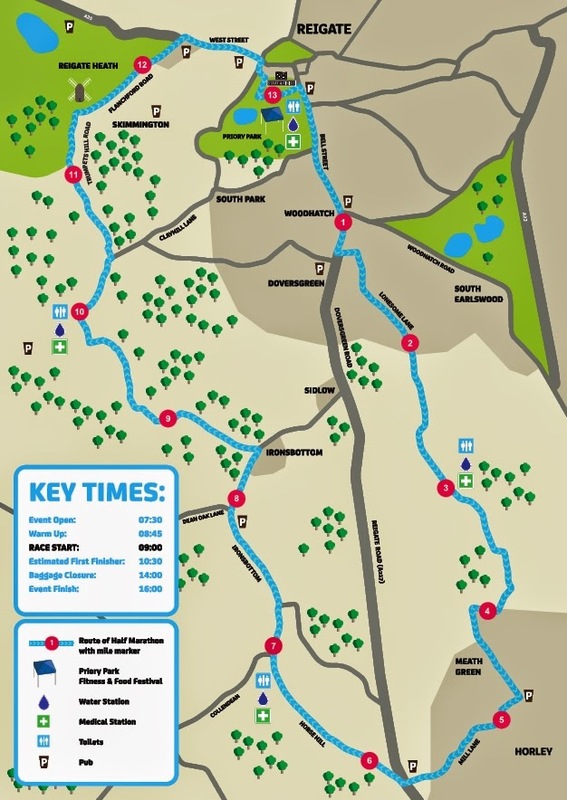 The Race was through the Surrey countryside, starting and ending at Priory Park. It was well organised and well marshaled, and mostly on closed roads. “Live” roads were signposted before you reached them, but there was an angry tailback near a single lane bridge that we had to run by. 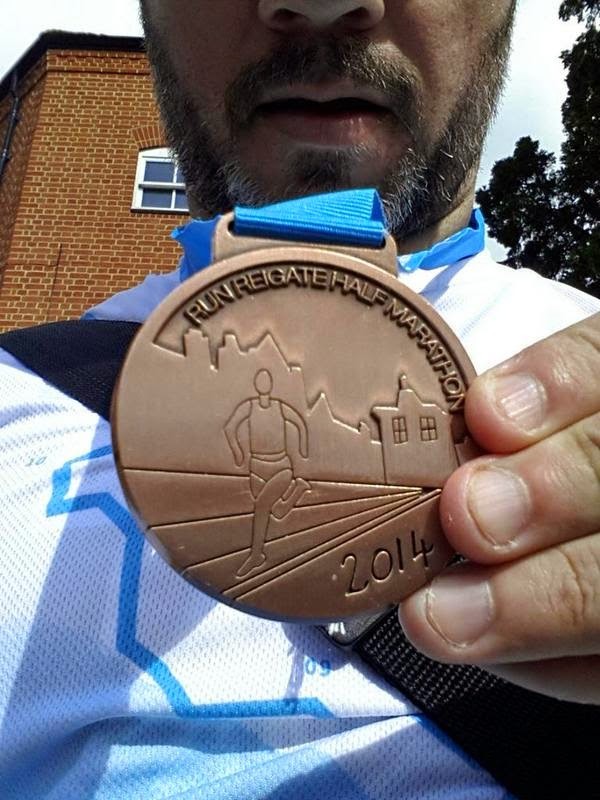 I had run a lot of races, this was the 23rd Race of 2014, already 2 more than last year, and this one I really liked. The race organizers did say it was flat, but I certainly felt the hills at the end. They also kept you well informed with emails, and really had made the effort. Well done to all involved. As you can clearly see from my slow, comfortable run. 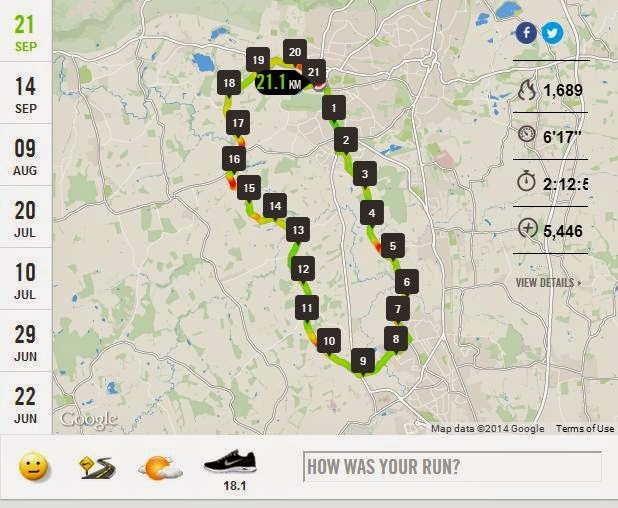 I did have an eye on the Run the River 10K on Tuesday, as well as the 3 halves for the next 3 weekends. There is, in my opinion, no benefit in hurting yourself by pushing yourself too hard, being injured and missing out on weeks of runs you have paid for. And I did feel good. 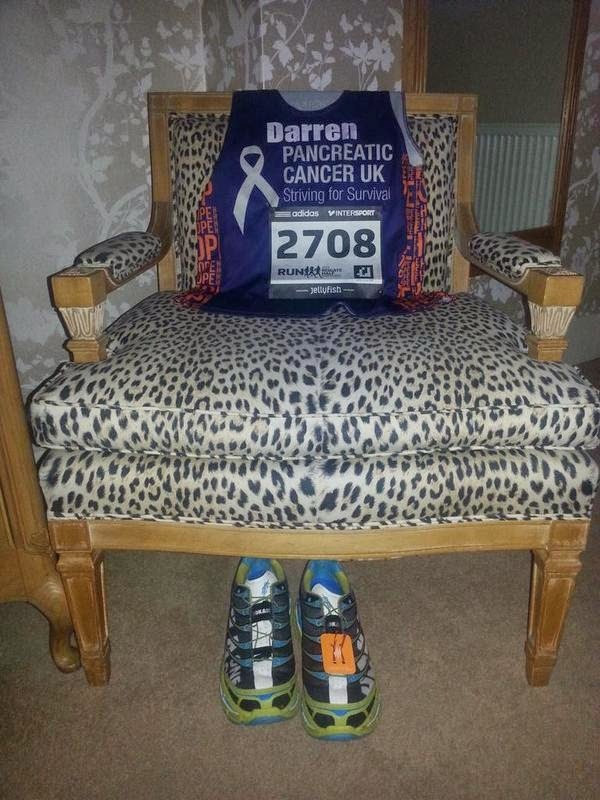 Not initially, but around mile 8 a runner took her headphones off and thanked me for running for Pancreatic Cancer UK as her mum had just been diagnosed with it, as had Bruno (from the hotel’s) mum. That thanks gave me a spring in my step and gave me a second wind, so I went off and ran the rest of the way back to town. I did earn this one. And the medal is great. It was designed by a girl at the local school and it is heavy. And it came with a great race t-shirt too. A lot of races no longer give you race t-shirts, or even charge for them (WTF!) but the Run Reigate/Jellyfish team got everything spot on. I recommend this race absolutely. 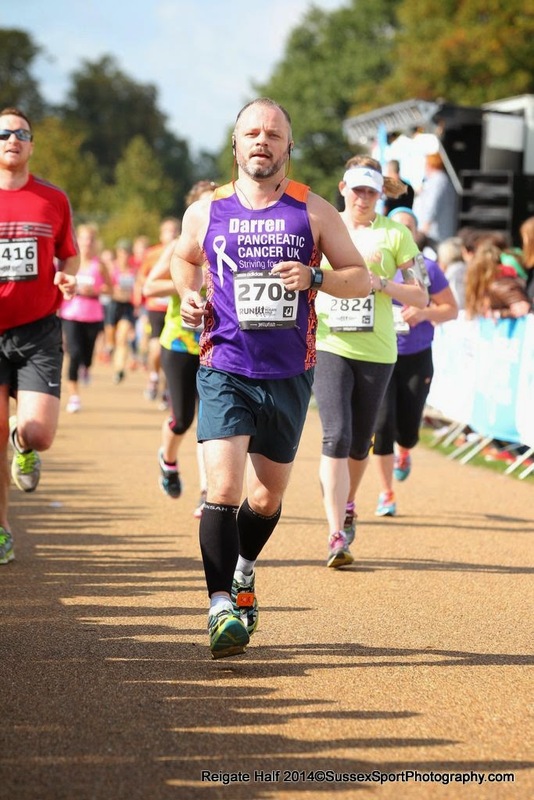 I would not run it again, as I am focusing on new races, but this was a good one, and Reigate has so much to offer in terms of shopping and food. My traditional burger was the Brooklyn Burger from The Bell. Again, SUPERB! Sadly, a young man died that day and I saw him collapse not once but twice. It was at the turn from the top of West Street, that led down to Priory Park that I first saw him hit the ground. He was young, in his twenties and a couple of fellow runners stopped and raised his legs and put something under his head. But he did not want to stay down, he wanted to finish. He was helped to his feet but he insisted that he wanted to continue. As I was running around the horseshoe shaped route around the park to the end I looked back and saw him zigzag, lose his footing and collapse a second time. People ran to his aid. It wasn’t until I read the news this morning that I saw he had died. It was very sad.